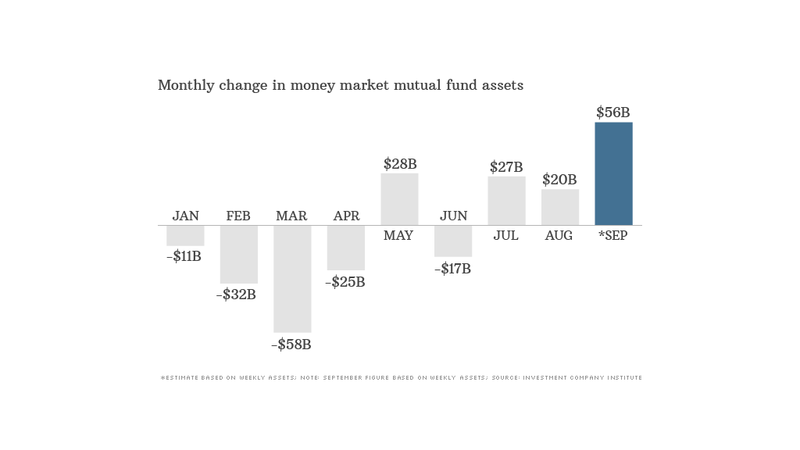 Investors added about $56 billion to money market funds in September, pushing the total assets to nearly $2.7 trillion--the highest level of the year. While many on Wall Street are still betting that Congress won't let the United States default on its debt, some investors are taking a bit of extra caution. They are loading up on cash. Over the past three trading days, Cumberland Advisors has been increasing the cash positions in client accounts. The Sarasota, Fla. firm has about 20% of its $2.2 billion in assets in cash. Typically, the firm has less than 10% in cash during times when it's not fully invested in stocks or other assets. "The shenanigans in Washington are awful and worsening," said David Kotok, chairman and chief investment officer at Cumberland. Meanwhile, individual investors have also been jumping into money market mutual funds, investments in short-term securities that are often viewed as a relatively secure way to park cash. It's sort of like a bank deposit. Investors added about $56 billion to money market funds in September, pushing total assets in these funds to nearly $2.7 trillion. That's the highest level of the year, according to the Investment Company Institute. People may be increasingly looking for safe havens during these tumultuous times. But it's worth remembering that even money market funds are not immune to a crisis. 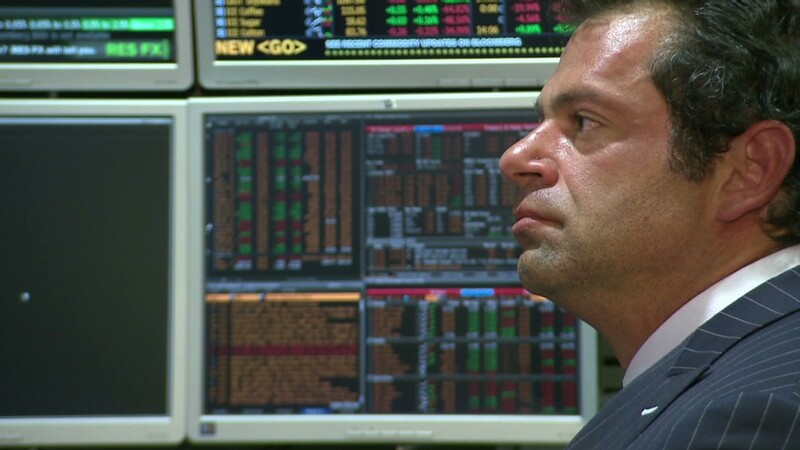 These types of funds were hit hard following the 2008 financial meltdown, for example. Still, it may be hard to convince nervous investors that now is a good time to be invested in stocks and bonds. Kotok said he met with a client Tuesday who said he hasn't been sleeping well due to worries about the gridlock in Washington. Kotok said this investor wants to be "out of the market." While Kotok thinks Congress will ultimately raise the debt ceiling in time to avoid a default, he said there's a good chance lawmakers will take the debate to the last seconds because "that's what they do." "The United States government, except under emergency conditions, is failing to function as a rational organization," said Kotok. Dan Yu, managing principal of EisnerAmper Wealth Advisors, is also holding on to a greater than usual amount of cash for his clients. Yu boosted cash holdings to about 10% in late July, up from a usual 2%, amid worries that the Federal Reserve would taper, or scale back the amount it purchases in bonds each month. Although the Fed ultimately decided against tapering for now, Yu still has maintained a high allocation in cash now that investors are worried about the debt ceiling. Neither Yu nor Kotok expect the government to default on its debt, but they are waiting to see if stocks slide further before they consider putting their cash back into the market. So far, the decline in the stock market has been steady but modest. Though the Dow has declined 11 of the past 14 trading days, the blue-chip index is down only 6% from its all-time high reached last month. The index is still up 13% this year. Yu said he's looking for at least another 5% decline in the market before he'd buy more stocks. For Kotok, it could take a bigger sell-off. But he's still relatively bullish for the next year or so. "There's no way to project a bottom right now, but I think we're going to see it at the point of climatic selling: more panic and a swoon," he said. "When I see that, I'll be ready to put our cash to work, because I think the market will be higher than it is now next spring."